The longer I play at free roam level the lower my fps drops, down to 1 frame per second. If I quit out to menu and continue, everything gets back to normal, for the time being, then fps gradually drops again. Perhaps there are some objects on the map that aren't properly disposed over time? Little green blobs maybe? It needs debugging to say for sure. Thanks in advance. Edit: Remember the trick with final boss that allows player to get new zooid and quit out before completing boss fight as long as 1 minion is alive? Turns out it also works on cage boss. I kinda like this bug, though, having full zooid collection is fun. But you might see this the other way. 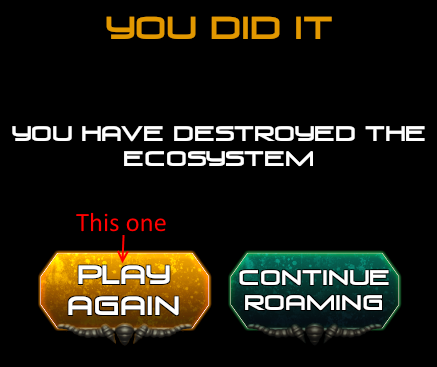 Also, when I click Play Again button after final boss - it doesn't do anything. PS: Is this a good place to leave bug reports? I used to leave bug reports in this post so that other players would see them to prevent duplicate reports, but now I notice there aren't many bug reports coming from other players, so would you like me to sent reports anywhere else?